On Nov. 7, the Hillview Task Force chose a contemporary one-story “look” with peaked roofs for the new Hillview Community Center, a look that is consistent with existing civic buildings and in harmony with the surrounding low-rise residential area. Lalahpolitico: I think the Tam & Noll architects preferred modern roofs, but they did not push for it much. There was a little slide show and speech by Pam Tam about respecting and appreciating history, but not being enslaved / constrained by it. But ~60% of residents prefer the constraint of history; so we are getting what we say we want. Image A is “modern” slant-shed-butterfly roof. Not quite 40% prefer a modern roof line. Images B plus C are “gabled or peaked” roof. 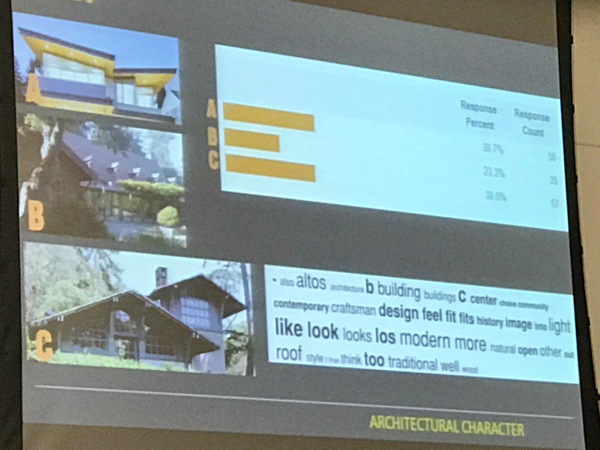 Over 60% of respondents prefer a gabled/peaked roof line. The Hillview Task Force settled on a indoor-outdoor floorplan around a long triangular courtyard. I believe the straw poll had 6 votes for the triangle courtyard, 4 for a indoor-outdoor plan around a square courtyard, and 2 for a linear building floorplan with a central interior hallway for circulation. The architect team said they preferred the triangle plan because 1) it fit best on the site and 2) it created the most opportunity for creative outdoor landscaping. It also saves many of the existing redwoods. The floor plan with the triangle shaped courtyard was prefered by the majority of task force member and also by Tam & Noll team. 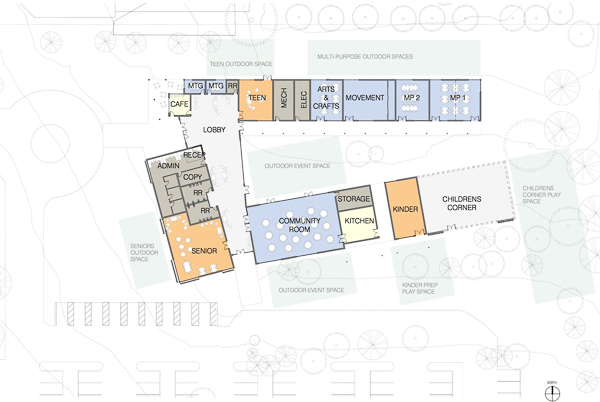 The T&N architect has been penciling in Children’s Corner 3,000 feet of interior space and the 3,500 of exterior space in all of the recent floorplans. A few weeks ago, City Council agreed to pay extra to add another 3,000 feet to the original 15,000 sq. feet that had been budgeted for City recreation. T&N said the Nov. 6 floorplans shown at the meeting did include the 3,000 more of City sq. ft. apparently by making all the rooms somewhat larger, not by adding more rooms…[at this time.] 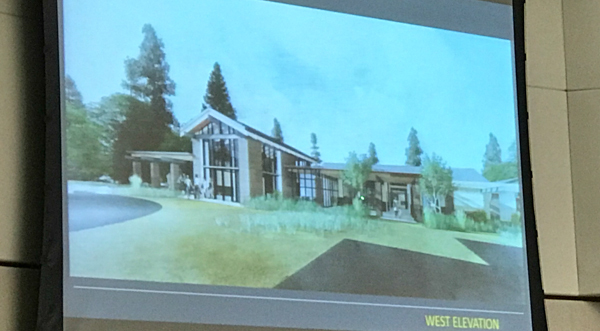 The Children’s Corner expansion will be paid for by Children’s Corner; however, an open issue is whether the non-profit can put up a little more cash upfront rather then in the 20-year lease. See prior post. At the Nov. 7 meeting, some Hillview Task Force members were dismayed that there still were no sketches of an “improved pedestrian connection” to the library and the rest of the Civic Center. This feature has been referred to as ” a trellised promenade” at prior meetings. Two things are going on. 1) City Financial Director is reviewing the total City Capital Spending Plan and is recommending only some of the extras that City Council exuberantly agree to Oct. 26. The promenade is not one of the extras staff is recommending. The Nov. 14 City Council Study Session will prioritize spending. We’ll have to watch that study session to know which Hillview project “extras” make the cut, and if Children’s Corner tenancy is still approved. 2) Lalahpolitico: removing the “promenade” extra from the Hillview project at this time makes abundant sense. 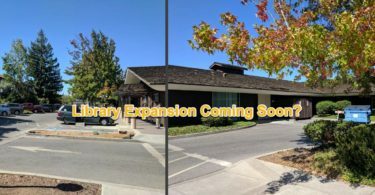 There is a movement afoot to get going on adding 11,000 square feet to the Los Altos Library building…so any “promenade” between the Hillview project and the old library could get mostly torn down. City Staff is actually writing the “final design concept recommendation” document to present to City Council in December. However, Asst. City Manager, Jay Logan, agreed that Hillview Task Force members insights could be included as an attachment to the main document. 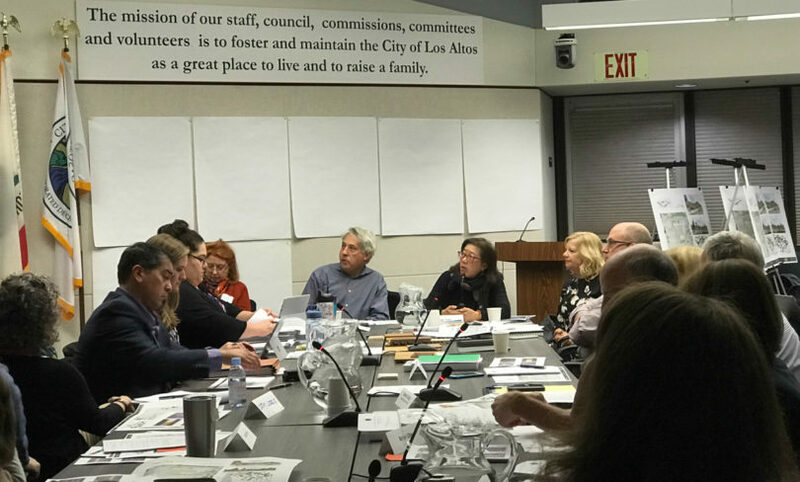 About half the Hillview Task Force spoke out, cumulatively spending about 30 minutes relaying their hopes, advice and remaining concerns to City Council. [City staff recorded the remarks]. The majority of the Hillview Task Force preferred this design with mainly gabled roof lines. ? A Hilton Inn Express? Who will chose the final exterior materials, windows and colors? The Hillview Task Force disbands in December. Good questions. 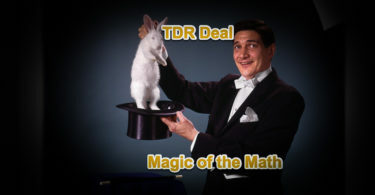 Obviously T&N architects want to be the key deciders; they are the expert architects; we hired them for their good taste and knowledge of construction. But Lalahpolitico thinks perhaps T&N would like to test some of their upcoming design choices on small sets of “clients.” At the end of the project, they want the City Council clients to be happy and satisfied. How about a two small, short-term volunteer task teams? 2 to 3 months. One for the exterior materials choices. A second one for the interior choices. Recruit them whenever it is appropriate for the the project timeline. Former Hillview Task Force members should be invited to apply; but Lalahpolitico would hope for some significant number of new faces too. About a year ago I joked with a Council member about what would be the most politically palatable design for a new Hillview Community Center… a design with the fewest people grumbling. We agreed it would be a copy of the key elements of the library and the City Hall — a low angle, peaked roof, perhaps even with the nun’s hat white plaster eaves! So I approve of the Hillview Task Force’s choice of a peaked roof from a political angle. However, I do wonder how that design choice constrains the prospects of the building being LEED gold. Wouldn’t those slant /shed roofs be better for solar…perhaps for passive temperature control too? Maybe only the building entry way needs to have that peaked roof? I’m no architect…just wondering. I too am part of the majority enchanted with the charms of the triangle floorplan. However, the City recreation director preferred the plan with the INTERIOR central hallway. He point out, it does rain in California. Also, I think it is easier to set up and tear down seating and tables…when there is an interior hallway. So I suppose it is more practical and easier to operate. Buyer’s remorse? But changes to these key decisions of the Hillview Task Force are highly unlikely. 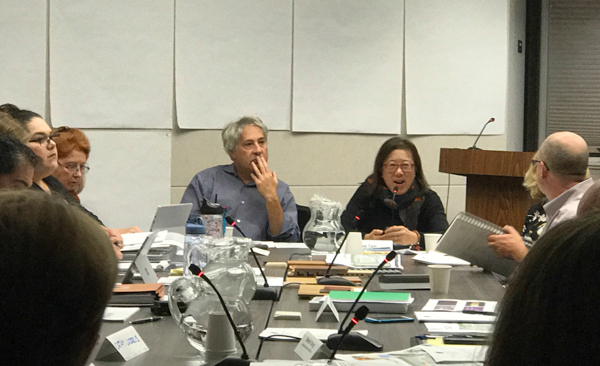 Tam & Noll took pains during the Nov. 7 meeting t0 assure the Hillview Task Force that the conceptual design decisions they have been making WILL BE CARRIED THROUGH the process for the next two years even though the task force is being disbanded. 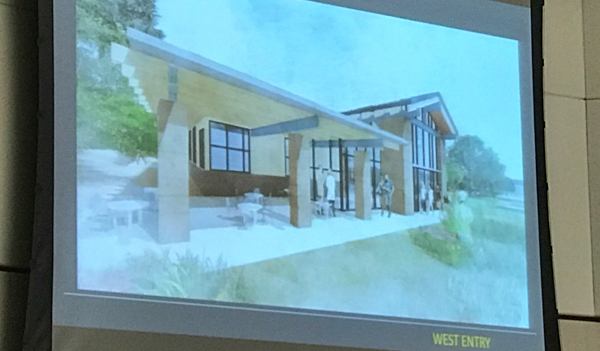 They presented a history of their Los Gatos Library project as an example of a “napkin” concept getting built as conceived. In the next few weeks, the architect will prepare refined conceptual drawings of the triangle floorplan and peaked roof exterior for the December City Council meeting. In 2018 they will start on detailed schematics to take to the Planning Commission and for CEQA review. After clearing those milestones, the architect will prepare construction drawings that the City needs to show potential construction contractors during the RFP bid process.